« A Musical Comedy for All Ages Celebrates … Music! CD cover art by Molly Knobloch, with graphic design by Mel Green. My new CD is here! 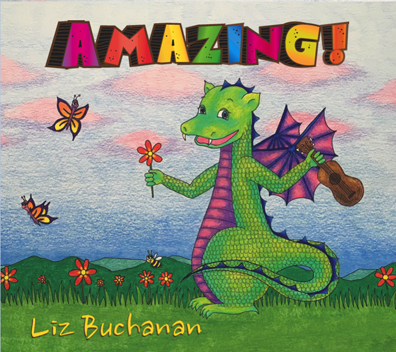 It’s called “Amazing!” It has a happy, musical dragon on the cover, drawn by my talented artist daughter, Molly Knobloch. The dragon is featured in the song “No Fire, Dragon!” which I wrote 10 years ago while working in a preschool classroom of children aged 3 and 4, in Lexington, MA. For a limited time, you can hear this song for free on my SoundCloud site. The recording features the excellent sax playing of Billy Novick, who’s brought his multiple musical talents to several of my CDs. With those words, a song was born. I worked from the comments of the children, who wanted a friendly dragon they could play with. In practical terms, they wanted to be sure that the dragon wouldn’t breathe fire, or eat them or their pets. They also liked the idea that the dragon could fly them around the sky, rather than playing its more traditional role of getting into duels with knights. While I never recorded the dragon song up until now, it has served me well over the years. For ten summers, I produced original plays at the summer camp at the Arlington Center for the Arts, where I now serve on the board. These plays were freewheeling affairs where I would present a story, then let the cast decide their roles. We’d make up some songs and improvise scenes that would get written into the final script. We’d also sing some songs that I came up with in advance, both my original songs and a few from other sources. One play that we produced twice was the story of The Reluctant Dragon by Kenneth Grahame, written in 1898. Grahame’s dragon seems to fit right in with the “No Fire” message; it prefers to hang out in its cave and write poetry rather than getting into duels. Unfortunately, the nearby townspeople are locked into their preconceptions about dragons and hire St. George, the knight, to slay it. But good St. George gets to know the dragon, thanks to a sensible boy who’s become the dragon’s companion. They secretively work out a mock duel to satisfy the fearful town. In the end, the truth becomes apparent, and the townspeople accept the dragon for what he is! The song “No Fire!” was a great addition to that play, as well as a play we did based on the myth of the Golden Fleece. The dragon in that story is not so friendly, making the message of “no fire” even more appropriate! It makes me smile, to know that children, the people I work with every day, are a subset of our population that believes magic is real. That’s the kind of wonder, optimism and excitement I want to channel into my own work and spirit. Yes for magic and imagination! Congrats Liz.